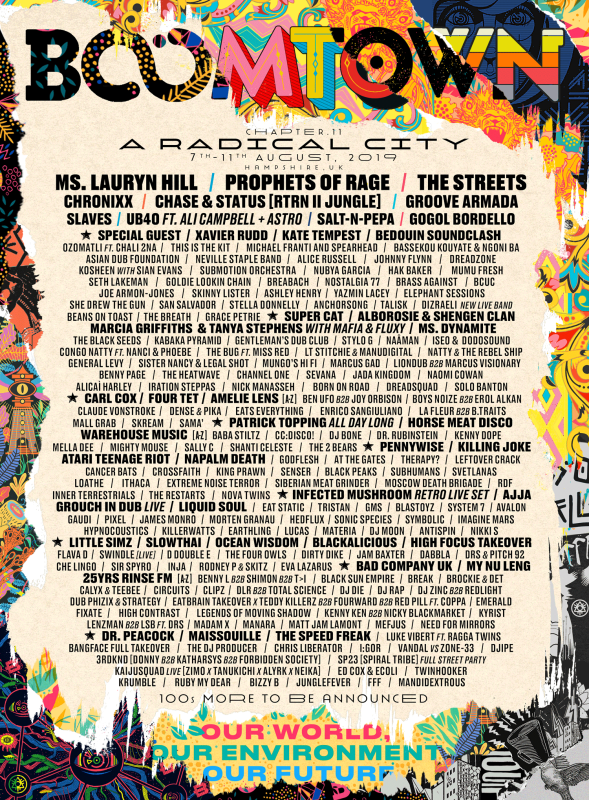 Boomtown​ has revealed the line up for the 11th instalment of the ​66,000 capacity​ music festival taking place over​ 7th – 11th August ​at the ​Matterley Estate nr. Winchester. ​Mixing up a huge range of musical genres with ​other worldly set design​ and an​ immersive storyline​ to provide ​a festival experience unlike any other​, the 2019 line up is a perfectly hand crafted mix of all genres from reggae to punk; techno to folk, and so much more! Headliners include; the seminal style and sounds of ​Ms. Lauryn Hill ​for rock-rap supergroup Prophets of Rage ​who combine members from ​Rage Against the Machine, Cypress Hill ​and Public Enemy,​ pioneers of alternative hip-hop meets garage ​The Streets​, leading reggae revivalist ​Chronixx​, drum and bass royalty ​Chase and Status​ with their RTRN II JUNGLE takeover, British electronica duo ​Groove Armada,​ with their epic live show, barrier smashing all-female rap crew ​Salt-N-Pepa​, ​Britain’s most successful reggae band ​UB40​ ft. ​Ali Campbell and Astro, ​unapologetic punk from ​Slaves a​nd the very welcome return of the riotous ​Gogol Bordello​ for their third appearance at Boomtown.